The new menu preview feature now has an on / off switch in the preferences window, and due to popular demand the small sized previews have increased to 192 x 192 (instead of 128 x 128). The zoom-when-you-pause feature now works reliably on all systems, and this build works correctly under Mac OS 10.4. Please download it and give it a spin! 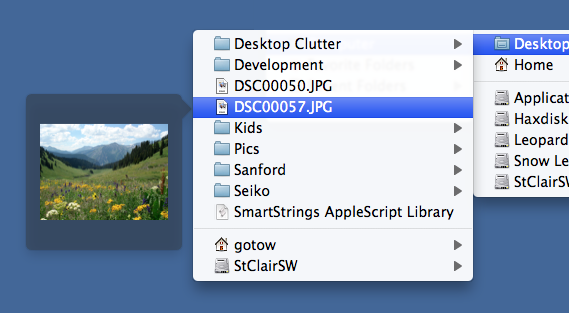 Default Folder X now gives you file previews in its menus. As you mouse through Default Folder X’s hierarchical menus from the menu bar, you’ll see a preview of the file that’s highlighted in the menu. Hover there for a couple of seconds and the preview will enlarge. In Open and Save As dialogs, Default Folder X now puts a “Computer” item at the top of the folder hierarchy in the path menu. New Spotlight tags were sometimes not written out to the shared OpenMeta recent tag list. This has been fixed. Spotlight tag completion now ignores differences in diacritical marks. Added support for Fluid site-specific browsers when they’re running as menu extras. Previews now correctly follow aliases so that a preview of the original file is shown when you select an alias in an Open dialog. When two folders with the same name are in a menu, the menu items for them will now include the name of the parent folders that uniquely identify those folders (Default Folder X used to just show their immediate parent folders, but sometimes those had the same names too). Fixed an AppleScript problem that would cause Preview to print a PDF file over and over again if you selected a the file in the Finder and chose Print from the File menu. Changed the rebound feature so that filenames with a ‘:’ character are recognized correctly in Cocoa applications. Corrected a problem that would result in Default Folder X not loading in multiple running applications that had the same creator signature (when running both Photoshop CS3 and CS4 at the same time, for instance). Default Folder X was saving empty Finder comments, resulting in Spotlight attaching empty com.apple.metadata:kMDItemFinderComment attributes to some files. This has been fixed. Fixed compatibility problems with python-based applications that use appscript. Added support for 64-bit PowerPC applications to the scripting addition. Corrected inconsistent rebound behavior on network server drives. Fixed the Extras/DFX script so it doesn’t show a busy cursor when it pops up the Default Folder X menu. And if you hover over the menu item for a few seconds, that little preview will expand into a large one so you can see more details. Just browsing my hard disk with this has turned up ton of images and documents I didn’t know I still had! There’s a full change log in the Beta Read Me file, and usual disclaimers about it being a prerelease version apply (it may have bugs, etc). I’d love to get some feedback on both the menu item previews and the other improvements, so grab a copy, give it a try, and let me know your thoughts! Extended the startup delay in the workaround for python appscript applications so that they don’t run into errors when they receive AppleEvents. Corrected a problem that would result in DFX not loading in multiple running applications that had the same creator signature (if you’re running both Photoshop CS3 and CS4, for example). Changed rebound so that filenames with a ‘:’ character are recognized correctly in Cocoa applications. Added a “computer” level menu at the top of the path hierarchy in the path menu that appears above the file listing in Open and Save As dialogs. Fixed an AppleScript problem that would cause preview to print a PDF file over and over again if you selected a PDF file and chose Print from the File menu in the Finder. New tags were sometimes not written out to the shared OpenMeta recent tag list. Added 64-bit PPC architecture to the scripting addition. Made tag completion insensitive to differences in diacritical marks. Fixed the Extras/DFX script so it doesn’t show a busy cursor when it pops up the menu. A couple of months ago Steve Becker, a fellow indie software developer, approached a number of us about putting together a different kind of software bundle. His concept was to take a grass-roots, “farmers’ market” approach: Bring a software bundle straight from the developers to you. Usually, bundles are not assembled and marketed by the developers, but by someone else who does the advertising, marketing and payment processing. Those people usually reap the bulk of the profits revenue from the sale, passing only a small percentage of the sale price on to the developers of the software. Wouldn’t it be great if developers could just get together and bring you a bundle themselves? This is the concept behind TheMacBundles.com, a web site that Steve has put together to deliver great software deals to you without the middleman. Default Folder X is one component of the bundle, along with other long-time favorites, such as DragThing, GraphicConverter, Spell Catcher X, Cover Stream, HoudahSpot, Mariner Write, and Steve’s own iPrint. It’s a great bundle of software and sells for $49.95, only $15 more than a copy of Default Folder X alone, and a $200 savings off the combined prices of all the apps. Yes, the marketing isn’t as slick, but it’s a great deal on some excellent software. One of the things that convinced me to participate is that I personally own and use quite a few of these apps myself. So head over to TheMacBundles.com and get a deal on some great software! But hurry, the deal only lasts until June 14!